Hi everyone, today we have A.J. Walkley with us, offering a window into how Twitter can help writers with exposure. We all know that as more choose writing as a career path, finding ways to become better known on the other side of the keyboard is something we all need to think about. A.J. has had some great success doing this, and is here to show us how. No matter what type of writer you are – a fledgling just starting out; self-published; indie published; repped or unrepped; or those who’ve beaten the odds and stepped over the line into traditional publishing – you know just how important exposure to the industry is to find success. Without taking a leap, risking your pride, and putting your writing out there, you can never get to that next rung on the ladder. Fortunately for us all, there are a multitude of opportunities to get that needed exposure today; all you need to do is sign online for many of them to open up to you. One area alone with many chances to take advantage of is the fast-moving social media platform of Twitter. Fiction contests are popular across Twitter and allow authors to hatch new ideas seen by the most influential agents and editors out there, without all the stress of a query letter. I first heard about #TwitterFiction Festival, for one, a few months ago when my literary agency posted about a contest related to the event. Writers of all calibers have the opportunity to submit a fiction idea that can be written in tweet-form. Along with 20-25 bestselling authors who are featured during the five-day virtual writing festival annually, 20-25 lesser known writers are chosen as well. I decided to enter the challenge with a crime novel idea that had been percolating in my mind for the better part of a year. An esteemed panel of judges from across the industry, including editors from some of the biggest publishing houses, would be critiquing submissions. But in the overwhelming flood of entries that pour through news feeds in contests like this, how could I stand out from the crowd? How could I be noticed? I decided a fiction story told on Twitter just wasn’t enough. So I shaped the story to be told from two Twitter accounts – a detective and a killer – and included multimedia aspects like photos, fake news clippings, and video footage. It must have stood out: I received a congratulatory email at the beginning of April saying I’d made it into the final round of submissions. I am one of 22 featured authors chosen to showcase my idea in specific time slots with many in the publishing industry watching. #TwitterFiction Festival is a tremendous opportunity for writers for several reasons, the first being the eyes you get your writing in front of from the get-go. A panel of judges from across the publishing industry choose the official participants; 2015 saw judges from Quirk Books; Little, Brown and Company; Avon Books, HarperCollins; Simon & Schuster; Hachette Book Group; Grove Atlantic; Penguin Random House; and St. Martin’s Press. On top of those esteemed entities, this year, for the second year in a row, the Association of American Publishers and Penguin Random House are presenting the event. A contest like this forces authors to stretch the limits of their creativity, too. I had never tried to parse a novel or storyline into 140 characters before. Including visuals in both photo and video form, along with my words, was an even greater challenge, and my “book” has certainly benefited from it. While I was one of the chosen featured authors, anyone on Twitter can craft and Tweet short fiction using #twitterfiction throughout the festival. It’s a fantastic way to showcase wild and exciting stories in a format that’s rarely been seen before. The only limit is your creativity. This particular writing opportunity is not the only Twitter-based contest out there, either. You’ve probably heard of #PitMad (Pitch Madness), where authors craft a 140-character pitch to agents and editors for the chance to gain a full manuscript request. The Women’s Fiction Writing Association has another contest using the hashtag #WFPitch. #SFFPitch is a great contest for showcasing science fiction and fantasy ideas. You can also always find an abundance of agents tweeting under the hashtag #AskAgent if you’re trying to learn what agents do and do not want to see. The best part about these contests is that, even though each may only list a few featured judges, you can be guaranteed there are hundreds of eyes from the publishing industry refreshing their Twitter feeds throughout the day in hopes of finding your next amazing idea and requesting to read. Join me on Twitter Tuesday, May 12th from 2am-3am EST (you bring the coffee, I’ll bring the entertainment!) 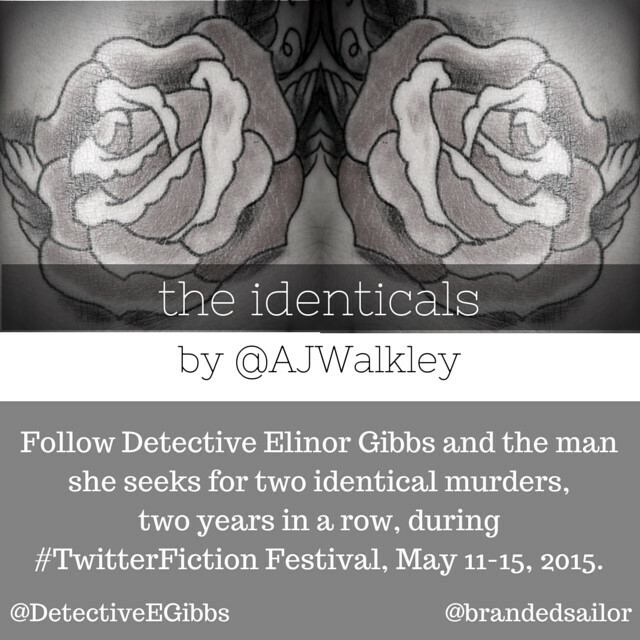 and Friday, May 15th from 9pm-10pm EST for my two featured time slots where I’ll be presenting my new crime novel, the identicals, and see what the festival is all about. I’ll be tweeting from @DetectiveEGibbs and @brandedailor, and retweeting from my personal account, @ajwalkley, as the story unfolds May 11-15, 2015. Thank you so much to Angela Ackerman for the opportunity to contribute to Writers Helping Writers! If you’re planning to participate and share your own #twitterfiction throughout the festival, please let me know on Twitter so I can watch your story unfold, too! Will you be watching #TwitterFiction unfold, or have you participated in #PitMad or another Twitter contest? Tell me about your experience in the comments! PSSST! Don’t forget, we’ll be putting up our first entry for the Emotional Wound Thesaurus this Saturday. See you then! Have just read your blog and signed up to twitter. I need exposure. having my first interview with an editor/publisher this Saturday. Fantastic post – many thanks. Funnily enough, just yesterday, I tweeted my first ever 140 character story for #Fic140 which is running till Friday. A good exercise! I’ll follow you on twitter – good luck with your tweeted submission. Pretty fascinating stuff. I’m new to twitter and can’t imagine writing a novel in tweets. Good luck! Thank you so much, Angela! And I couldn’t agree with you more. I also love the fact that Twitter specifically helps writers write much more succinctly which many of us are not used to – you have to use the least amount of words possible to get your idea across. It’s great practice! Congratulations and good luck! I’ve never participated in a Twitter contest myself, but I’m a big believer in the power of Twitter to help fiction authors whether they want to go the traditional or the self-publishing route. Twitter takes down the walls and obstacles that normally stand between authors and agents/publishers and makes everyone more accessible. This #TwitterFestival sounds like a very interesting way to use twitter to get noticed. Absolutely, Angela! It’s a great event once a year, but even better that you can use the hashtag #twitterfiction year-round to tweet short fiction.